Whenever I walk down Via del Boschetto in Monti, something in the storefront of Estremi inevitably catches my eye and beckons me to come inside. Estremi is my favorite type of store – an eclectic mix of ethnic furnishings, recycled and organic materials, and ethnic accents, all inspired by travel and offering a curated selection of items. 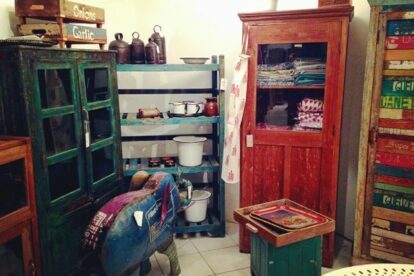 Everything in the store is stylish, rustic, and for sale: from the worn furniture propping various knick-knacks (ceramic painted knobs, carved wooden letters) to the hanging paper lamps illuminating the store. Visiting the store is like traveling through the world and seeing a mix of artifacts representing all continents. You can find knit towels made in Turkey, glass tea cups made in Morocco, cashmere scarves made in India, and recycled wood furniture made in France. Many of the items are in fact selected at the Maison & Object design trade fair that is held in Paris twice a year. If you appreciate unique and colorful home furnishings, you will love this store. You can also find it on Via di San Francesco a Ripa 149 in Trastevere and Via di Monserrato 101 in the center.